MyGolf par-teed in style today as it celebrated an important milestone, with 15,000 participants introduced to golf through Australia’s national junior program over the last twelve months. 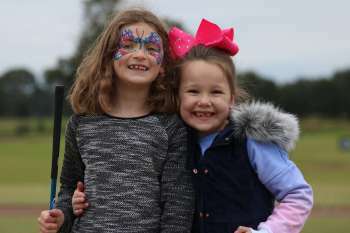 Josie Laurie, an eight-year-old golfer from the Sandhurst Club in Melbourne’s south-east, was the 15,000th MyGolf participant in 2017-18 and, to celebrate, she invited her fellow Sandhurst Club MyGolfers and friends to her the ultimate MyGolf party. 30 kids enjoyed golf activities hosted by PGA Professionals, a jumping castle, face painting and a MyGolf cake. From Royal Melbourne to Kalgoorlie Golf Course there are now over 400 active MyGolf centres in Australia, all helping kids to take their first steps in golf, which has helped the program, run jointly by the PGA of Australia and Golf Australia, more than double in size in the last year. “Junior golfers are the future of our sport. Recognising the importance for a united national junior golf program the PGA of Australia and Golf Australia aligned to deliver MyGolf,” said Gavin Kirkman, CEO of the PGA of Australia. “We are delighted to have introduced 15,000 children to golf this year; it’s is a significant milestone for the MyGolf program and points to a bright future for Australian golf,” said Stephen Pitt, CEO, Golf Australia. MyGolf is designed for 5 to 12-year-olds and provides a safe, fun and accessible introduction to the sport of golf by promoting skills development, as well as the social and fun aspects of the sport, to the wider community. Josie clearly loves attending her MyGolf session every week at the Sandhurst Club. “I love playing MyGolf at Sandhurst because you can do it at lots of different places like the putting green and driving range, and lots of different holes on the course,” said Josie. “The driving range is my favourite because you get to hit the balls far and the signs tell you how far you hit it.